We are looking for companies to join us in our mission to Turn It Purple this November for Pancreatic Cancer Awareness Month. 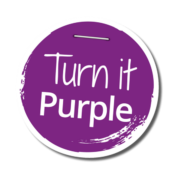 Turn it Purple is our flagship Pancreatic Cancer Awareness Month campaign which takes place every year throughout November! It is a chance for everyone to unite and show their support to those affected by pancreatic cancer and give the disease the attention it so desperately needs. It is also a fantastic opportunity to raise much needed funds for research into early diagnosis, which is what this year’s Turn it Purple campaign is dedicated to! We have made it really easy for you to get involved! There’s no limit to what you can do, whether it be for one day or for the whole month of November! World Pancreatic Cancer Day is on the 15th November 2018, so perhaps you could organise something just for this day! Staff could make a donation to wear purple for the day – anything from clothes, accessories, nails or even hair! Get the team involved in a static spinning or rowing challenge! There are so many other ways that you and your organisation can support Pancreatic Cancer Action – not just during Awareness Month. We can also offer support to traditional corporate fundraising ideas for example selecting us as your “Charity Of The Year” or signing up to our Payroll Giving scheme. We have lots of challenge events that take place across the country throughout the year which are great for team morale and collegiality! We also offer Occupational Health talks about pancreatic cancer – you can find out more about these here. Previous Article Enter our cover photo competition Next Article Should I participate in a clinical trial?